Experience the exhilaration of a historic time when commerce and transport were heavily dependent on the waterways. After we meet and greet you at your hotel we will head to a coconut farm where you will see different coconut-based products like sugar, oil and delicious candy. 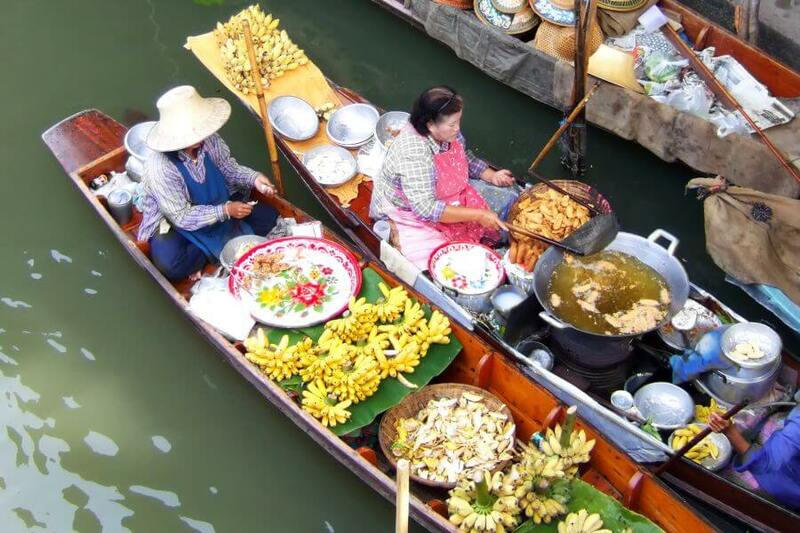 Following that, you will ride on a fast long tail boat through the narrow klongs to the still active Damnoen Saduak floating market in Ratchaburi, which was featured in the James Bond film, ‘The Man With The Golden Gun’. Here you will see many small boats from which people are busy selling their goods. Some merchants even prepare food on them! If you want you can take the traditional paddle boat (optional) so you can experience the days of the past in an authentic way yourself. Our last stop of today will be the “Wat Bang Kung”. This undiscovered temple gives you the feeling being like Lara Croft in Tomb Raider as the temple is located inside a banyan tree. At the completion of the day we transfer you back to your hotel in Bangkok. Price is based on join in tour with a minimum of 2 persons.